Schoolhouse Skates is perfect for wintertime. This lovely project measures just 12 x 12 inches making it perfect for a tabletop display, an add-in to your "Mini-Wall", or frame it for the winter season. 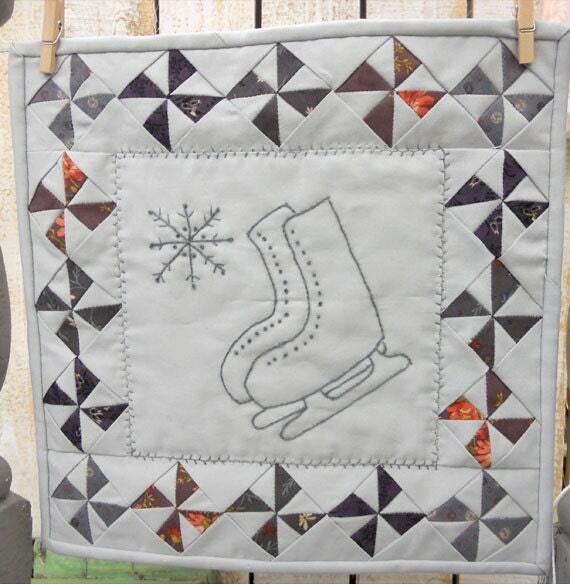 Lovely little pinwheels made of purples surround the lovely skates and single snowflake. The grey background adds to the chilly January scene. Embroidery stitches used are stem, French Knots, back stitch, and straight stitch. Refer to your favorite embroidery book for stitch directions.